Just going through the final stages of proof reading and correction, but, after a long period, the book will be published in January. Should be a good way to start the year. 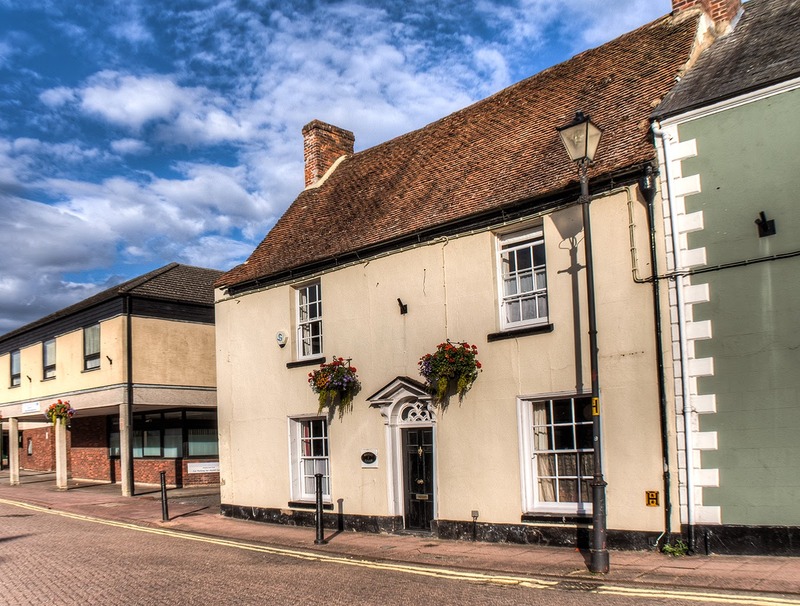 Stony Stratford was essentially built along the Watling Street, which became the High Street once it was given a name. Most houses and inns backed off the High Street in long strips of land, either one acre or half an acre. After 1194 a market was founded on the Calverton side. It seems pretty clear that this became the Market Square. As the town developed, alleys and lanes came off the High Street or developed beyond the Market Square on the east side. Many names have either been lost or have changed. Here is a list. This is now Silver Street. As the original name suggest this was the area for the cattle market. Horse Fair still survives as Horse Fair Green. Cow Fair was renamed Silver Street on the Silver Jubilee of King George V in 1935. Horn Lane originally branched off Cow Fair (Silver Street) and had a “L” shape. The first part of it was renamed Oxford Street. This was probably the first part of the Wolverton Road. There were 8 dwellings recorded in 1851. including a pub and a few shops. By 1861 it had changed to Wolverton Road. This followed the course of New Street. All these properties were acquired by the Reverend William Sankey, a man of considerable personal wealth who spent a great deal of it improving Stony Stratford. New Street, the Vicarage and St Paul’s College were all built at his expense. This was probably at the northern end of town and might be identified with the older Pudding Bag Lane. It appears as Claridge’s Lane in the 1851 and 1861 Censuses and it is quite possible that it was called Claridge’s Lane in order to spruce up its image. I don’t know who this Claridge was. It was probably pulled down when the land was cleared to build St Pauls School. It is mentioned by Sir Frank Markham as being in the St Paul’s area. Quite how it acquired its characterful name is not known. There was an inn called The Coach and Horses. Markham doesn’t identify it in his History of Stony Stratford, but it is definitely in the censuses of 1851 and 1861. Judging by its location it was likely a descendant of The Horseshoe Inn. The 1841 Census identifies Coach and Horses Lane as formerly Malletts Lane. This lane disappeared when St Pauls was built. Here’s an original name! The Back Way eventually became Russell Street and Vicarage Road in the 19th century but for centuries was the back lane bordering all the burgage plots on the High Street. Here are the old names that have survived without change. 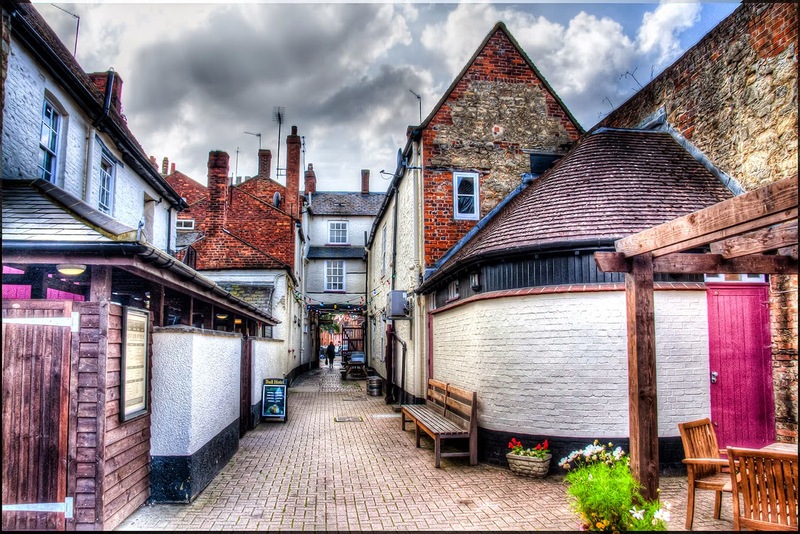 Older documents usually refer to it as the Watling Street, so it is unclear when the term High Street came into being – possibly in the 18th century when the road was built up and became “higher”. Plainly, when street names became desirable, this name was applied and stuck. This appears as the Market Place in some earlier documents, but by the19th century Market Square is well established. Must date from medieval times because a mill has been there for at least 1000 years. This appears in late medieval times, named for the business that was conducted there. As houses developed around it the name Horse Fair Green was applied. From Mill Lane the Harlot’s Walk or Path skirted the back of all the High Street plots and came out by the Barley Mow. Obviously this was never an official name but one that pretty much defined what you could expect to find there after dark. This is my 500th post since I started this blog – so a milestone of sorts. Activity has not been as great this year as in the past, but I am still here and still at it. It is now four years old and since I began counting visitors after the first year the count is now 133.347. The blog seems to have grown its readership from a very small number at the beginning to over 5,000 a month. Thank you for your support. 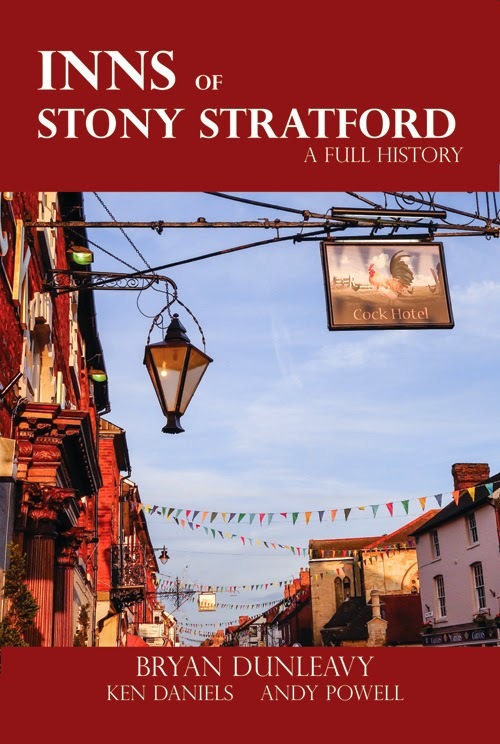 To mark the occasion I want to tell you about this book which we published last week – I Grew Up in Wolverton. We have used the medium of Facebook to gather a number of conversations about various aspects of growing up in this town. The period spans about 50 years, from memories from the 1940s to the 1990s. Back in January I asked Ruth Edwards to compile the material for this book and we have spent the last six weeks editing the material. We are quite pleased with the result, a 280 page paperback. The conversations are lively and funny but above all capture the essence of growing up in Wolverton as some of the tiniest details are remembered. I am very biased of course, but I do recommend that you buy the book. Click on the book and it will link you to another site where you can find out more. I know that some of you are not great fans of Facebook but it can have its positive side. A few years ago a Facebook group started up called I grew up in Wolverton, Milton Keynes where people could share memories. Quite suddenly, towards the end of lat year, the group began to take off and it now has over 600 members. Apart from anything else, it is proving to be an excellent source of photographs which have been scanned from old family albums. So far, so interesting. Last Friday, I suggested to the group that it might be possible to start pulling this material together in printed form and the suggestion met with enthusiasm from some quarters. At the moment I am inviting interested people to join what will be a not-for-profit company dedicated to publishing Wolverton and area memories. If you would like to know more, please go to this site for more information. I haven’t been doing much blogging of late, partly (but not entirely) because I have been adding to and commenting on the Facebook page “I grew up in Wolverton, Milton Keynes”. The group was started by Faye Elizabeth Lloyd from a later generation than mine about two years ago. It started modestly enough as these things do and maintained a steady state for some time. Recently, it has taken off and become a lively board for discussion and reminiscence. I think there are now in excess of 500 members of the group. So if you haven’t discovered it I recommend that you do. It’s good reading for everyone interested in Wolverton – fun too. If you have a Facebook account you can find the group easily enough. If not, then I’m afraid you will have to join Facebook. Following from yesterday’s blog, here is an account of Richard Moon’s life from the DNB. Sir Richard Moon gave his name to Moon Street in Wolverton. Moon, Sir Richard, first baronet (1814–1899), railway company chairman, was born on 23 September 1814, the elder son of Richard Moon (1783–1842), of Liverpool, merchant, and his wife, Elizabeth, who was the daughter of William Frodsham. The family of Moon was settled at Newsham, in Woodplumpton, Lancashire, before the end of the sixteenth century. Richard was educated at St Andrews University, but left without taking a degree. He intended when a young man to take holy orders, but his father opposed this, and so he entered his father’s firm. He married Eleanor (1820–1891) daughter of the major shipowner, John Brocklebank, of Hazelholm, Cumberland on 27 August 1840. They had six children, of whom two died in infancy. Little is known of Moon’s early adult life, but he appears to have withdrawn from the family firm by 1851. However, his family had invested early in railway shares, and in 1847 Richard Moon was elected a director of the London and North Western Railway Company (LNWR). He became chairman in June 1861, holding that position until he retired in February 1891. The London and North Western Railway Company came into being on 16 July 1846 by the amalgamation of the Grand Junction, the London and Birmingham, and the Manchester and Birmingham railway companies. The chairman of the new company was George Carr Glyn. The marquess of Chandos became chairman in 1853. He was forced to resign in 1861, and was briefly succeeded by Admiral Moorsom, who died in May of that year, and Moon was elected chairman. Since joining the board in 1847 he had established a reputation as an outstandingly able administrator with little time for the senior executives of the company. He brought about the resignation in 1858 of Captain Mark Huish, the first general manager of the new company. Moon was essentially conservative in his outlook, but could be innovative when he thought it in the best interests of the company. He certainly ran it very tightly, constantly looking for means of cutting costs, but he could also spend lavishly if this appeared to him to be justified—for example, on the expansion of the works at Crewe. Annual receipts of the company rose from £4.3 million in 1841 to £11.8 million in 1891, and the dividend from 4.25 per cent to 7 per cent, while the network grew from 1030 miles to 1830 miles. The company was employing 55,000 men in 1885, and was, at that stage, the largest joint-stock company in the world. Under Moon’s guidance it became famous for the punctuality of its trains, the courtesy of its staff, and the creation of two new towns, Crewe and Wolverton; and in all of this he took a close personal interest. Both the Grand Junction and the Manchester and Birmingham Railway Co. had reached Crewe before the amalgamation. The town began as a wayside station in the parish of Church Coppenhall, in Cheshire, in 1837. It was the Grand Junction that opened railway works there in 1843. The company set about building a new town, and this was continued after the amalgamation. It was administered at first from Euston, but the Crewe local board was formed in 1860, and the town was incorporated in 1877. The company provided everything: housing, water, gas, churches, and schools. It presented the municipal park to the town in 1887, the year of Queen Victoria’s golden jubilee, when Moon was created baronet and became the first freeman of the town. Bessemer steel works were opened in 1864 and four years later the Siemens–Martin open-hearth furnaces were added. After 1864 carriage building was concentrated in Wolverton and locomotive building at Crewe, where locomotives were manufactured from raw materials, everything being made on site. The London and Birmingham Railway Company had acquired 8 acres of land at Wolverton, a small village and parish in Buckinghamshire, in 1837. It began to build houses in 1839. Further land was bought in 1840, and by 1847 a new station had been built, and new streets laid out. As at Crewe, the company provided everything: housing, gas, a building society, a savings bank, market house, shops, and church, and opened a park in 1885. The company itself withdrew from building houses in 1860, preferring to lay out the plots and control the type and standard of those built. Richard Moon retired from the board of the LNWR on 22 February 1891, his wife having died on 31 January. He died at his home, Copsewood Grange, Stoke, Warwickshire, on 17 November 1899. His eldest son, Edward, had died in 1893, and so he was succeeded in the baronetcy by his grandson, Cecil Ernest Moon, born in 1867. Sir Richard Moon was described by his obituarist in The Times as ‘the hardest of hard workers and the sternest of stern disciplinarians’. He was said to combine ‘an assured confidence in the correctness of his own judgement with an autocratic spirit which hardly recognized the possibility of that judgement being criticized by others’. At the same time he was of ‘a singularly retiring disposition’ (The Times, 18 Nov 1899). He was Conservative in his politics, and remained a devout Anglican throughout his life. There is evidence of settlement her during Romano-British times and even at one time a vinyard. By the time of the Norman Conquest the manor was smallish (800 acres) and extended south from the river Ouse all the way up to Linford Wood. The settlement had 7 villagers, 3 smallholders, and 4 slaves. There was a mill by the river. These numbers might extrapolate to a population of 50 or 60. About the turn of the 13th century, Simon de Stanton adopted the surname Barre (Barry). After this the manor was known as Stanton Barry, later contracted to Stantonbury. The manor passed through a multitude of owners until it fell into the hands of the Spencer family in 1744. Various parts of the manor were sold to the London and North western railway to create New Bradwell in the 19th centry, and I assume the remainder was sold to Milton Keynes Development Corporation in 1970. That part of the manor close to the river, which we know as Stanton low, appears to have been the main part of this small settlement and the ruins of the church still stand as a reminder of this abandoned village. There must have been some sort of manor house at the site from the earliest times but we don’t know very much about these buildings. We do know that Sir John Wittewrong, who purchased the manor in 1667, built a mansion house there. One assumes that it was there 100 years later and it was possibly occupied by Thomas Harrison who was the steward for the Spencer estates. This same Thomas Harrison also added the management of the Radcliffe Trust estate at Wolverton to his portfolio of interests in 1773 and shortly after he built Wolverton House for himself and his family. It may be that after this the Wittewrong mansion was pulled down because there are no further references to it. In the 19th century, when the census comes to be recorded, there is only one family living at Stanton Low, a farmer’s family living on the Newport Road, where the present farm buildings are located, and several cottages at Clare’s Farm, on the higher ground of Stantonbury, south of the canal. The small church at Stanton Low, dedicated to St Peter, dates from the 12th century and had a long and useful life for the first 700 years and a rather patchy one for its last century before it fell into ruin in 1956. I did say on Nov 30 that I was going to finish a watercolour of these shops the following day. Obviously that hasn’t happened mainly because installing a new TV aerial and cabling for digitl became a priority. It will come.